The ZOE XL2 BEST Xtra Lightweight stroller is the absolute perfect stroller for travel and big city use! It's aluminum frame provides all of the long-lasting stability of other high-end strollers while helping keep the stroller extremely lightweight at only 16 lbs! This stroller includes a very easy to use, quick fold. It comes with two child cup holders, one child snack tray, one parent cup holder and one padded front double belly bar all for FREE! The huge, extendable canopies feature large hidden extensions which provide your children tons of shade! There is also a large storage pocket on the back of each canopy to hold your keys and cell phone in addition to a magnetic peekaboo canopy window on the top of each canopy! The large storage basket can easily hold shopping bags, your diaper bag, and more! 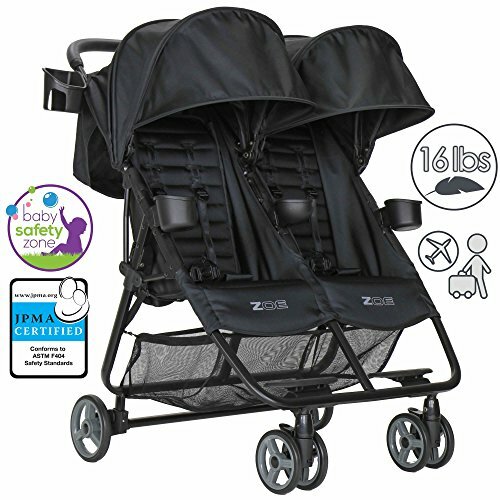 If you are looking for the best double stroller for travel, urban use on public transportation such as subways, buses, or taxis, or a great twin stroller for quick trips to the store or in and out of your children's school, the ZOE XL2 stroller is the perfect choice! Huge, 3-Panel Extendable Sunshade Canopies With Magnetic Peekaboo Windows & Storage Pockets For Phone & Keys, Deep 135 Degree Reclining Seat Rated to 18kg & Tested to 50lbs Capacity Per Seat, Quick 5-Point Backpack Style Harnesses & Large Storage Basket! If you have any questions about this product by Zoe, contact us by completing and submitting the form below. If you are looking for a specif part number, please include it with your message.